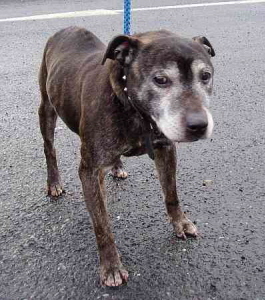 When Arthur arrived at the pound he was judged to be at least 10 years of age. As one of the girls tried to prepare him a bed he climbed into the plastic shell before she could even get the blankets in, all he wanted was a bed. They made him comfortable, and everyone fell for this gentle, sweet man who had dignity and calm. When Arthur's days in the pound had ended, he was offered a rescue space in Devon at Tailends, and was transported with the help of our wonderful volunteer drivers. He was a dream to transport, spending most of the journey sleeping. On arrival he toddled straight off to find a bed and make himself comfortable. A call to the rescue next morning told us that Arthur was fine. He'd had a good breakfast and was enjoying lots of fuss, and was already winning hearts. However, later that morning the rescue rang us back to say that Arthur had collapsed and was unable to get up. 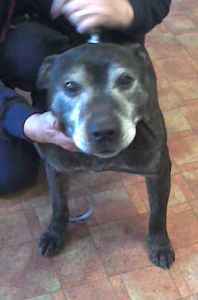 They had taken him straight to the vets where xrays revealed curvature of the spine and probable tumours in his lungs. They said his chest was very bad. As he was still unable to stand they had called to ask if we were in agreement that he should be allowed to go peacefully. With all the facts, and Arthur's obvious poor health we had no choice, and agreed that it was in his best interests. We know that he had been given great care whilst with the rescue and that it was the kindest option for him. Thank you to all those who helped Arthur. Although his new life had barely begun, without you he would have spent his last night in a cold kennel. The staff at the rescue gave him comfort and didn't delay to get him the treatment he needed, for which we will always be grateful. Sleep well Arthur, arrange your bed and never be disturbed again. For Arthur's's thread on our forum please click here.